When we gather an entire team in a room and explore their collective knowledge gaps, interests, and their delivery goals or roadmap — setting individual goals together as a team will lead to increased performance and motivation. This is because individual goals become more relevant with the added context and because focus increases when there’s a clear and direct link between challenges, delivery goals, and learning objectives. If you straight up agree and would like to know how you can start setting individual goals a.k.a talent management with entire teams instead of with individuals I’ve created an exercise that you can run with your teams. Skip ahead to the exercise if that’s what you came here for or keep reading if you’d like to learn where today’s talent management falls short, what you can do about it, and what obstacles there are between traditional talent management and handing it over to the teams. 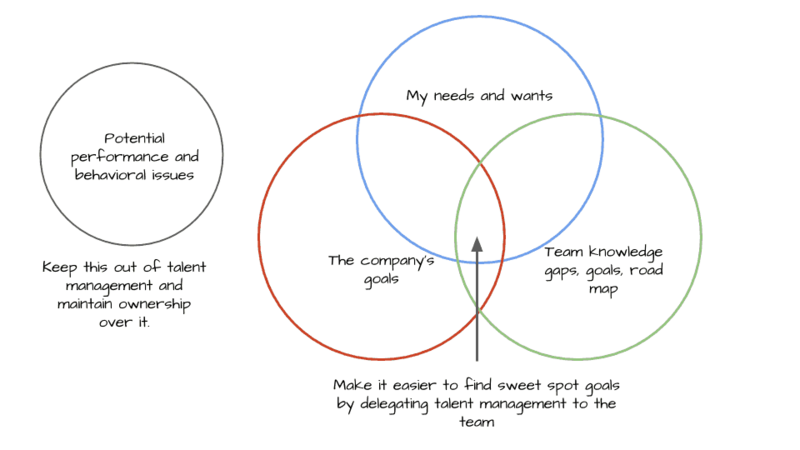 Where Talent Management falls short today. In many companies today, talent management is done out of context and individual goals are mostly based on what individuals want to learn. Managers may think that by considering an individual’s needs and wants, gathering behavioral and performance feedback from team members, and adding their own perspective on development priorities as direct managers, they’ve taken a holistic approach to talent management. But can that really be the case when development talks center almost entirely around the individual? Don’t get me wrong: individual input is still the most important part of setting individual goals. You want people to have goals they’re motivated to work towards, after all. But if the development conversation is only focused on individual growth without looking at the context of the team and where the company is headed long-term, there’s bound to be growth areas that go unnoticed despite being valuable to the team, the company, and, of course, the individual. What’s the alternative? To involve the entire team in setting individual goals! The missing dimension in the traditional approach is the team’s context i.e. its challenges, growth areas, and short- and long-term goals. Teams that consider every team member’s needs and ambitions, as well as the needs of the team, in individual goal setting outperform teams in which individuals set growth goals in isolation from their team’s context. But is this approach really what’s best for the individual? In fact, I’ve found that personal motivation actually goes up when people are able to directly and immediately see the impact that comes from the new skills they’ve learned. Setting growth goals as a team helps lead to individual goals that are directly relevant to their context, and the positive reinforcement that this brings increases the likelihood of both team and individual goal achievement. What’s more, as teams and individuals become more impactful and productive, happiness and job satisfaction also go up. If you’re wondering how this fits in with traditional or current forms of management, you’re not alone. Team-based talent management is still a new concept, and, as with all new concepts and changes, conversations to discuss concerns and get buy-in need to take place. Regardless of whether you’re a team member, a manager, or a Product Owner (“PO”), you’ll need to get buy-in from other team members to set yourself up for success. Sometimes all that’s needed is just a simple conversation. Acknowledge any skepticism and fears, and clearly explain expectations and constraints. Follow up by highlighting the benefits that succeeding with this exercise would bring to the team. Help them really visualize the problems that this approach could solve. Be mindful of group dynamics before trying this out. Teams that are newly formed or storming may not be ready to have growth conversations together. Lack of established trust and the potential for artificial harmony could get in the way of the openness that is needed to truly tap into the benefits of this approach. If you’re a manager and want to try this but the team you have in mind is not ready, you can instead start by doing the groundwork that’s needed. Manage group dynamics now so that they’re ready to try this out the next time you set goals. serving as a final checkpoint (and any combination in between). To get buy-in from a manager, it’s important to have her consider how she wants to be involved. This will vary quite a bit depending on the team’s needs and expectations, expectations from the wider organization, and her own expectations on herself. The manager might not believe it’s a good use of her time or could be opposed to the idea in principle. That’s not how it’s been done throughout her long (and successful!) career, after all. Listen to her concerns with an open mind, but also paint her a picture of the benefits that this approach will bring for her and the team. If the manager is on board but not sure about her level of involvement, help her evaluate where her interest and/or stake is with the model below. Help her see whether she is more tied into the growth process or the outcome. There is one exception to the handover, however. As a manager, you’ll probably want to keep ownership of performance and behavioral issues rather than handing them over to the team. And that makes perfect sense. Such issues are best not to do on a bi-yearly or yearly cadence anyway. What about team members who are actively looking to change teams? Even if that’s the case, short-term learning goals will still be relevant and valuable. Another approach is time budgeting. For example, 50% of their learning time can be invested in initiatives that will help their current team, and the other 50% can be invested in their future team or their general career development. If the person is checked out from their current team entirely, it’s also fine to have them sit this exercise out so that the goals that do come up will have sufficient ownership and buy-in from the team members that will remain on the team. A reasonably well-defined team mission and purpose. Have the PO prepare a few slides on this in advance to present at the beginning of the session. 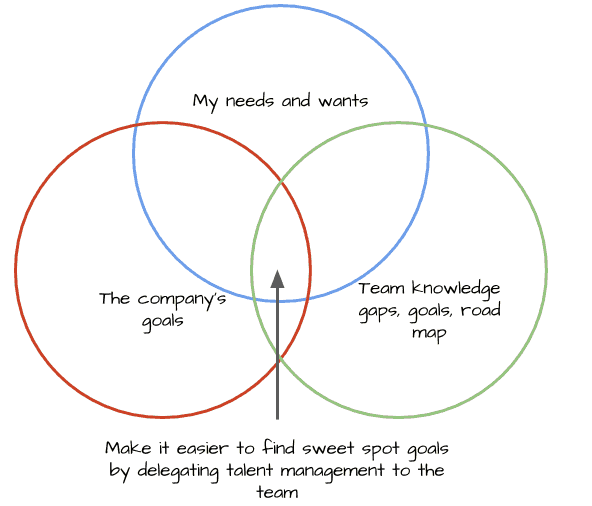 Show how team vision and goals fit together with the company’s vision and goals. 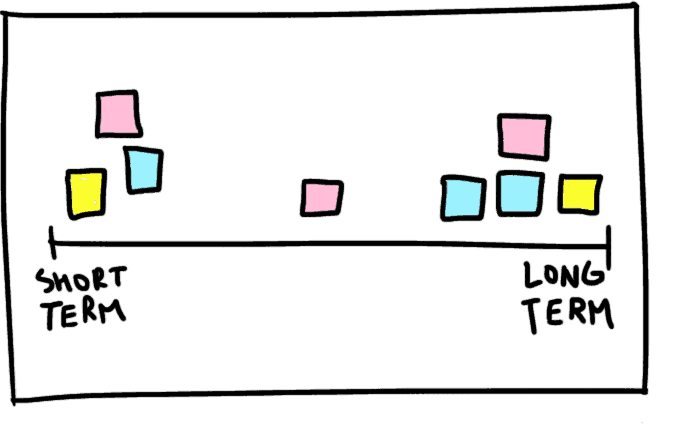 Non-linear team goals that stretch 3-6 months into the future e.g. metrics to impact, a User Story Map (or parts of it), and Impact Maps are ideal. Goals shouldn’t come in list format with estimated features to implement in a predefined way at a specific date but should instead be more flexible. Have each member reflect on their individual goals (as they relate to the team/things they feel comfortable sharing). Agreement between the team, the PO, and the manager to try doing team talent management. This includes explicitly deciding whether this exercise is input for the conversation between the team member and manager or if the team may decide on their growth goals during this exercise. Sufficient time. The exercise takes 1-2 hours depending on team size and goal cadence. With a small team, short goal cadence, and some practice, you can run this exercise in only 30-40 minutes. Constraints. Are there any learning budget constraints for example? And how much time is expected to be invested? Gather the team in a room. Revisit the team’s mission and goals. Have the PO to present the company vision, team mission, and team goals or metrics the teams need to impact. Highlight relevant team challenges. 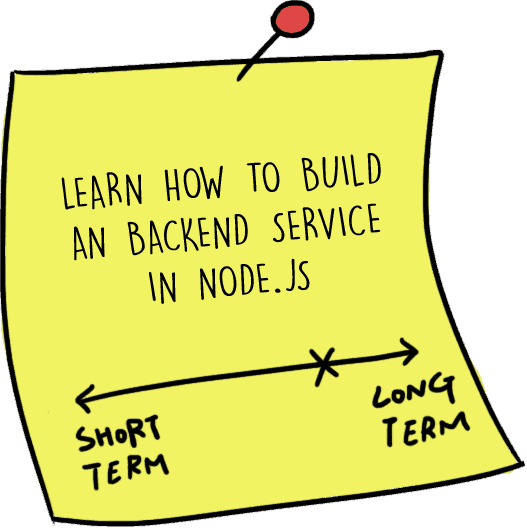 Ask everyone to share one or two challenges they see out loud such as “Lars who’s the only front end developer we have is going on parental leave in 3 months” or “Daily incidents are increasing” etc. Brainstorm individual and team development areas. Ask everyone to think about 3-5 things they could learn/skills they could develop to improve the team’s chances of reaching these goals. Also have everyone think about 1-2 things that the entire team could learn together that would improve the team’s ability to execute. (One thing per sticky). Help people clarify vague learning goals such as “Learn how to develop an app”, “Take a CCNP network certification”, or “Learn python” and ask them what they hope to achieve by doing so. Be sure to have them clarify how that relates back to the team’s goals and needs. Evaluate the timeframe of the goal. Ask people to indicate on the sticky if the goal is helpful to the team here and now or if it’s something they’re learning to help the team in future challenges (you’ll want a healthy mix). Prepare the matrix on the board. 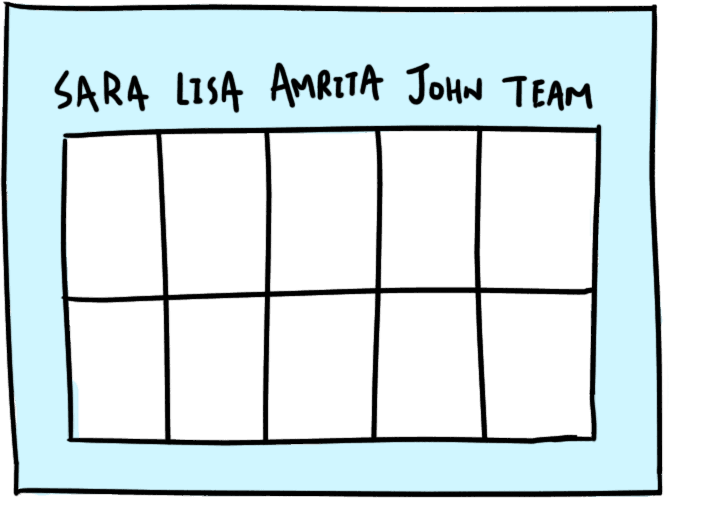 While everyone is busy writing, create a table/grid on the whiteboard with one cell per individual that fits 5 Post-its and one large cell for the entire team. Share findings. After 5 minutes, have people share what they could learn, how it would be helpful to the team, and what they think would be helpful if the entire team learned. 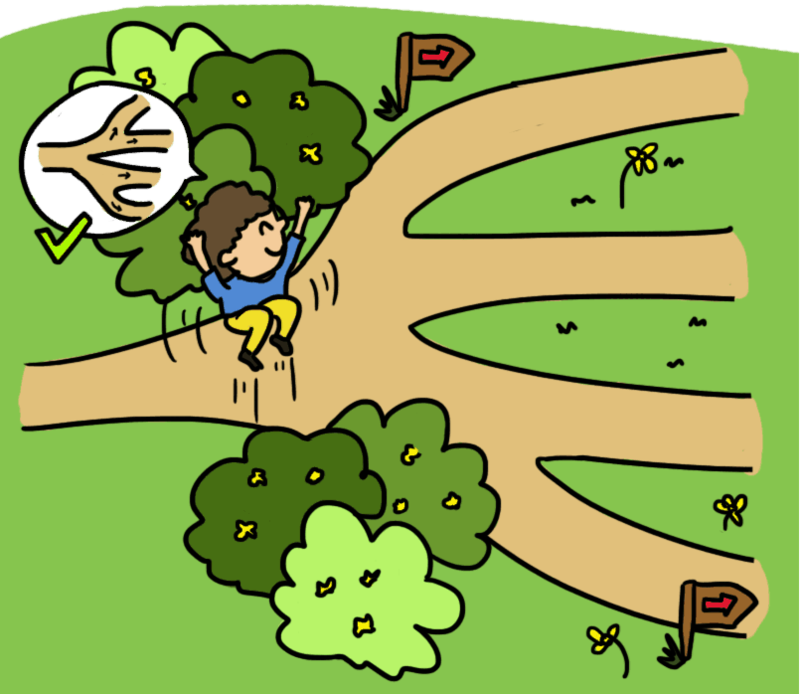 Invite people to ask clarifying questions, but postpone evaluation and judgement. Vote on which learning objectives would be most valuable to the team. Once everyone has shared their thoughts and added suggestions, it’s time for the team to indicate which goals they think will be most helpful. I suggest dot voting because it’s an easy way to indicate what the team thinks is most valuable. 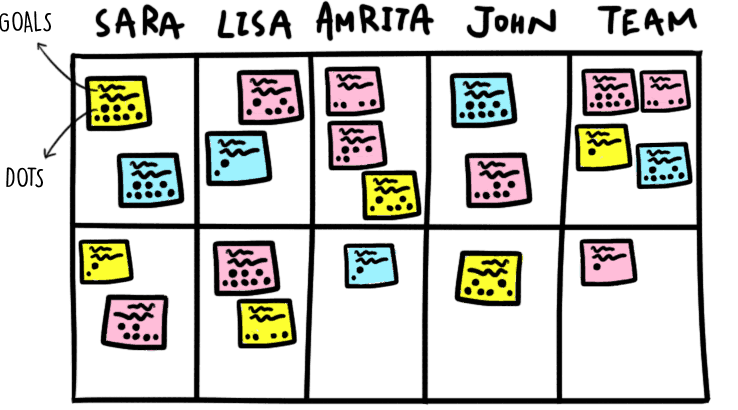 The individual can then choose to bring several stickies to discuss with her manager. Explore the most pressing objectives and the patterns behind them. Move the highest voted learning objectives onto the timeline. Look at the balance. A team with daily incidents might want to focus more on learning things that are valuable to the team next week. A team that knows it will have difficult challenges later might want to start investing in learning things that will be helpful for further down the line. Inform the manager (or team) what was decided. If your team and manager have agreed that the team can make growth decisions, inform the manager afterwards. 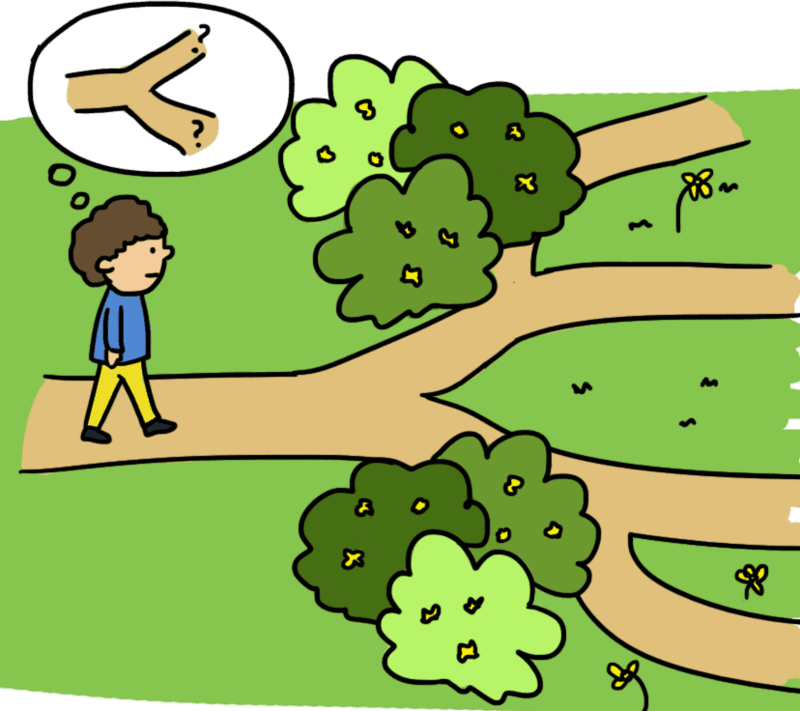 If the final decision happens between the manager and team member, you need to follow up with the team once that’s done to let them know what was decided. Keep a physical reminder of what the team has chosen to focus on. 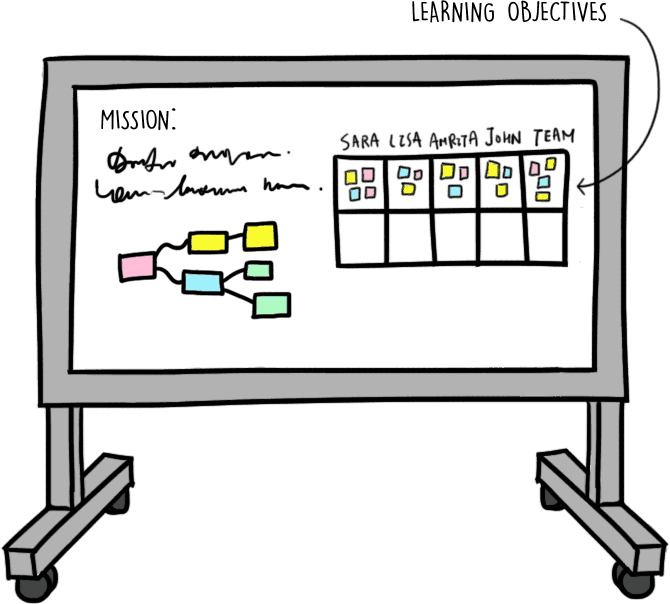 At the end of this exercise, you’ll likely have a board that looks something like this. Put it up on somewhere close to the team or make it digital for dislocated teams. Involving teams in talent management to this extent challenges traditional talent management thinking and many of the structures we have in place. But because there’s so much potential and the risk of trying is low with teams that are capable and interested in trying, it’s worth giving it a shot. It may take a few tries to get this right so don’t despair if , but you always have the old way to fall back on. If you’re interested in the concept but would like to explore whether this fits in your context, send me an email at viktor@cessan.se or book a free exploration call. If you decide to try it out on your own, let me know how it went afterwards. I’d love to learn from your experiences.